If My Airbags Deployed, Is My Car Totaled? “Is my car totaled?” is a common question asked after a severe accident. If you only have liability coverage and you total your vehicle, you had better have a lot of money saved up, because not one cent of the damage to your own car is going to be covered if you get into an accident (or if a tree falls on top of your car, a hailstorm pummels your car, or if your car is stolen...but if you’ve decided to buy the cheaper option of liability insurance, you’re probably willing to take this risk). If you have comprehensive coverage, you’re probably wondering whether or not you’re going to have to give up your vehicle forever, or just for the duration of the time that it is in the repair shop. Many times, you would be amazed what a body shop can fix. Other times, with severe damage, you are much better off not repairing the vehicle and taking the total loss settlement from your insurer as long as you are covered by your insurance policy. In this article, you’ll learn more about what goes into determining if a vehicle is a total loss and whether or not you can keep a vehicle after it has been totaled. Different states have different definitions of a total loss vehicle. 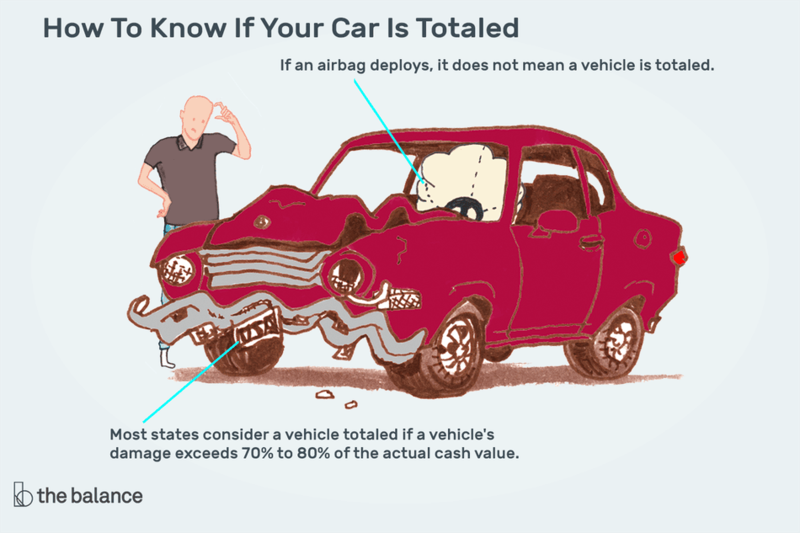 Most states consider a vehicle totaled using the guidelines that if a vehicle's damage exceeds 70 or 75% of the actual cash value it is headed for the junkyard. A few states alter those guidelines slightly. For instance, Florida goes with 80% damage before making a vehicle a total loss. Claim's adjusters use specialized computer software to determine the cost of the damage versus the actual cash value. My Airbag Deployed. Is the car automatically Totaled? It is often said that a deployed airbag means a vehicle is totaled, which is not always true. The reason so many people believe this is because a high percentage of vehicles are totaled after the airbag deploys for a couple of reasons. Lots of people carry physical damage coverage on aging vehicles which have highly depreciated. Airbags are very expensive upwards of $1,000. So when an older model vehicle has a deployed airbag, plus the body damage which caused the airbag to deploy in the first place, often the vehicle is totaled. Example: John has a vehicle that is 9 years old and carries comprehensive coverage on his insurance policy. He hits a deer on the highway and his airbag deploys. The cost of replacing the airbag and the physical damage to the front end exceeds the total actual cash value of the vehicle. His insurance company totals his vehicle out because it is not worth fixing. Newer vehicles depending on the value of the vehicle purchased could possibly be repaired. A new Hyundai Accent could still be totaled out fairly easily with a deployed airbag, whereas a new Cadillac Escalade might still be worth fixing. Example: John is driving his 6-month-old Cadillac Escalade on an icy highway. A traffic backup leaves him unable to stop and he rear-ends another vehicle. His airbag is deployed and there is front-end damage to his vehicle. The damage reaches 50% of the vehicle's actual cash value so the insurance company repairs the vehicle like, kind, and quality. Can I Keep My Car if it is Totaled? It is possible to buy back your vehicle with a salvage title once it is deemed a total loss. Insurance companies pay actual cash value for a totaled vehicle minus the deductible. You have the option to pay the insurance company a small fee plus the salvage value of the vehicle, typically ranging from $500 to $800. Once you buy the vehicle back, it is yours to do with as you please. You will need to check with your insurance company to see if any restrictions apply to insuring a vehicle with a salvage title. Knowing whether or not your vehicle is totaled is the first step in the claims process. If you are still unsure whether or not your vehicle is totaled, file your claim and ask your claims adjuster for more information. It is times like these you learn how good the customer service is provided by your insurance company.